Are you a writer, a photographer, social media guru, or just someone with a passion to help others? Sign up now to join the Youth Media Volunteers Network in the Pacific Region to produce empowering, engaging and effective youth led media. UNICEF Pacific is committed to identifying and exploring opportunities for empowerment of young people to produce youth led media that is for, with and about young people. When you sign up to this roster, you will become part of a large network of young people who will be invited to contribute to creating change through media by producing their own radio programs, radio spots, videos, visual artwork (paintings, illustrations), feature stories and blogs on a wide range of topics/thematic areas relating to protection, health, education, climate change, gender and more. 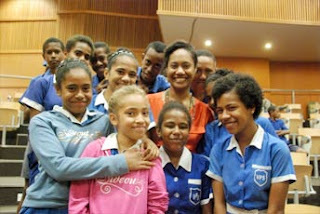 UNICEF Pacific will continue to work closely with its partners to secure safe, enabling and inspiring spaces including space in mainstream media and other channels for young people to gather, speak, be heard and take action. UNICEF Pacific will also continue to support strengthening the capacity of this network through youth media training and other initiatives as and when possible in line with available program funding.